Two years after building the first coaster in the SeaWorld chain, San Antonio's SeaWorld of Texas drew up plans and begun construction on a ride to dominate over their first steel coaster, the Great White; partnering with Morgan Manufacturing (now Chance-Morgan) to bring to life on land a new beast of the sea: the Steel Eel. Rising over the park at fifteen stories in height, the yellow and teal-colored steel coaster opened on March 6th of 1999 and gave Texas park visitors a new type of ride experience. 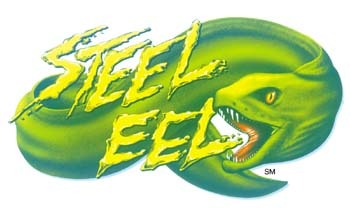 Without inversions, the Steel Eel uses a series of hills, humps, and airtime to provide its thrills, with eight hills in all in addition to a carousel curve and final S-turn maneuver. Built over a lake, the marine theme adds to the ride experience as thrillseekers dive down towards the water's surface during the circular, three-minute layout. Loading onto one of two six-car, 36-rider sitdown trains, Steel Eel riders must secure lapbars in place before being dispatched on their way. The ride gets rolling as the train completes a near U-turn and engages on the lift chain to pull the ride to the top of the first hill. After rounding the top, the yellow track sends riders plunging at a sixty-degree angle down the full way to the ground - a good 560 feet - and gaining a full speed of sixty-five miles per hour on the way. At the bottom, the ride veers to the left and heads up into a double camelback hill: climbing, diving a portion of the way to the ground, climbing again, and diving back to the bottom. The train hops up into the mid-course block brakes, but the hindrance is only temporary. The track banks to the right and dives back down, rising up again and curving under the block brakes in a carousel curve, then dipping down to the water. From there, passengers are sent through a series of humps and hops, being thrown out of their seats over three gradually-shrinking hops on the way back home. With a 90-degree curve to the left, and equal bank in the opposite direction, an S-curve finishes off the ride onSteel Eel.